Chocolate cake with mocha buttercream filling and vanilla buttercream on top. 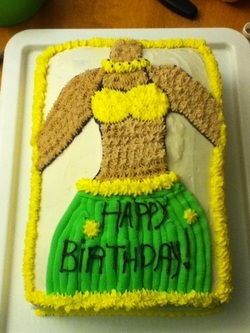 Hula girl is mocha buttercream. 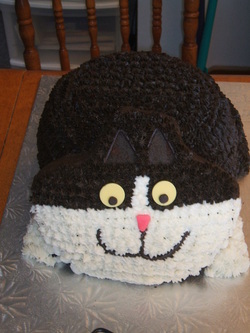 Made for a cat-loving friend, Kiki the cake, looks remarkably like Kiki the cat (check out my Facebook page for a side by side comparison). Body and head are both chocolate cake, all fur but white is chocolate buttercream, with vanilla buttercream for the lower face. Modelling chocolate wafers made perfect eyes! 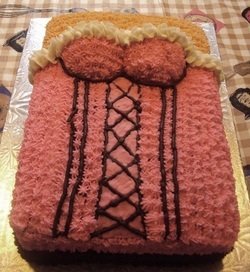 Corset with ruffles cake. 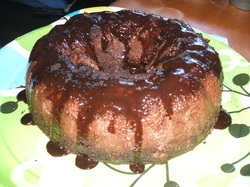 Cake is chocolate with chocolate buttercream undercoat. Decoration (corset, "skin", cupcakes) done in colored vanilla buttercream. Laces and ribbing done in chocolate buttercream. Cookies and cream cake. 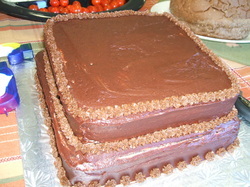 Chocolate cake with Fudgee-O buttercream in between the layers. 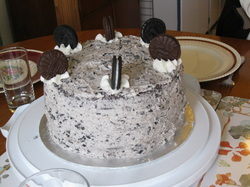 The outside of the cake was covered with Oreo buttercream and the cookie decorations on top alternate between the two. A cookie lovers dream cake!! 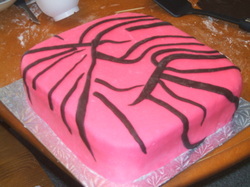 Print zebra print cake made out of white cake with vanilla buttercream and strawberries. Pink and brown are both modelling chocolate. Triple chocolate mousse cake with chocolate drizzle and Oreo crumbs sprinkled on top. Three layers of vanilla cake with buttercream. Deer is made of modelling chocolate, covered in white chocolate and painted with food paste. 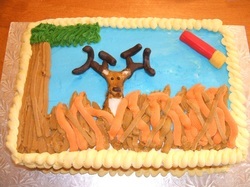 Antlers are modelling chocolate covered pretzel peices and bullet is modelling chocolate with fondant end cap. Four layers of rich, moist chocolate cake with a creamy peanut butter frosting in between. 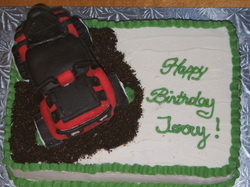 The whole cake is covered in a chocolate fudge frosting and decorated with chocolate buttercream. White cake with vanilla buttercream. Quad was constructed out of Rice Krispies and covered in modelling chocolate. 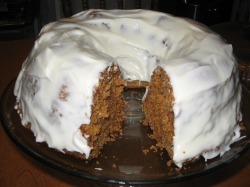 Moist, spicy carrot cake covered in creamy cream cheese icing. 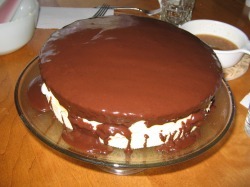 Delicious custard is sandwiched between two delicate sponge cakes and topped off with chocolate ganache. 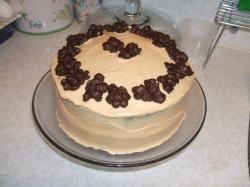 Chocolate cake with peanut butter icing and chocolate covered peanut clusters. 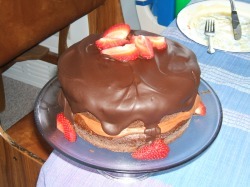 Chocolate sour cream cake with rich chocolate topping and fresh strawberries. 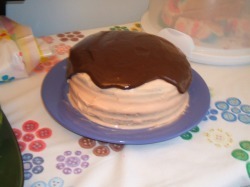 Chocolate orange layered cake with orange frosting and chocolate glaze. 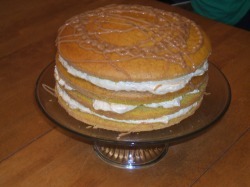 Pumpkin cake layered with cream cheese whipped icing and topped with caramel drizzle.